It's you versus a giant diabolical robot made of out of cars! 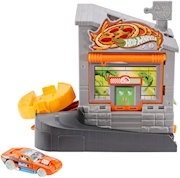 NitroBot™ is attacking the city, and he's captured a car. Watch out! Get too close and he might rip the road out from underneath you! The only way to take him down before he conquers the city is to face him head on. Launch from the left! Launch from the middle! 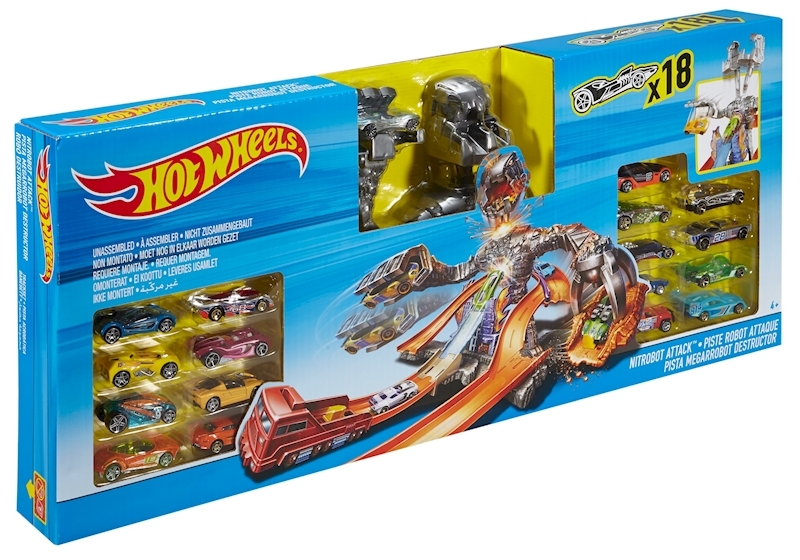 Keep moving your launcher and aiming your attack until with skill and timing you score a direct hit, causing the head of the Nitro Bot™ to fly off and his arm swing down in defeat, releasing the captured car and sending it racing to freedom! 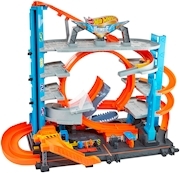 Connects to other Hot Wheels® tracks (sold separately) to build a world of play. 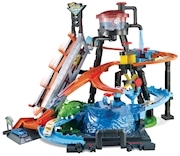 Includes 18 Hot Wheels® vehicles so the fun starts right out of the box!